STANDARD/ROUND/DONUT TUBING TOWABLES: These are the traditional shaped towables that look like an inflated inner tube. They can be ridden by laying on top of the donut for a more exciting ride or by sitting in the hole for a more secure feeling. These standard water sports towables offer hand grips and can be ridden by one or several riders depending on the design and are usually the most economical of the tubing towables. DECK TUBING TOWABLES: These towables are more flater and look like an inflated mattress. Perfect for the thrill seekers, on this tubing towable, the rider(s) lies on their stomach and holds on with their face very close to the water. This gives them the feeling of speed that they crave. Due to the flat shape of this water sports towable, it also tends to catch air more easily going over wakes and during quick turns making the ride more exciting and challenging. RIDE-IN TUBING TOWABLES: These watersports towables can accommodate up to 4 riders at once which is great for a family or group of friends to enjoy together. In this configuration, the riders sit on the floor or “cockpit” of the tubing towable, much like in a small boat, and are surrounded by the sides of the towable. Often the floor is inflated also so the ride is quite comfortable and smooth. This is a perfect water sports towable for younger children or those adults who prefer a ride of comfort and security over thrills and spills. RIDE-ON TUBING TOWABLES: These water sport towables are most often in an elongated shape-much like a torpedo or giant hot dog and can hold up to 6 riders at once. In this case, the riders sit on top of the water tube. Due to the high center of gravity, there tend to be a lot of rollovers and lots of laughs to go with it. These towables are great for large groups of all ages. Improves cardiovascular system: During the activity, you will be giving your cardiovascular system a good workout on the water. Improving your cardiovascular system increases blood circulation, bringing more nutrients and oxygen to your tissues and helping to remove waste from the body more quickly. Burns calories: Donut Ride is a great sport that burns a lot of calories. Muscle strengthening: The main muscle groups being worked while you are trying to stay on the towables at a stable position. Another main muscle group being worked are the Abdominal muscles as you try the be balanced it through waves and jumps. Entertaining and fun: As a fun recreational activity, towables can be done while on a family outing or when enjoying the beach with friends. 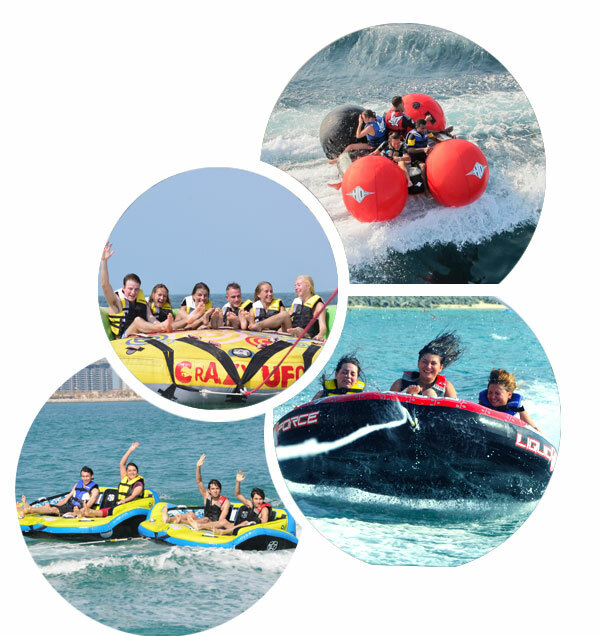 Donut Ride is watersports activity which both children and adults can enjoy together with great fun. With their ease of use, versatility, affordability and a just plain fun factor is a perfect fit for anyone. Wondering what to do during your holiday on the beach? Donut ride is one of the best ways to have fun on the beach.